On the afternoon of October 5th 1982, Séamus Ennis passed away in his sleep. He died in his mobile home at Naul, Co Dublin, not too distant from Jamestown, where he was born in 1919. He always professed a deep attachment for north County Dublin, the land of his ancestors, as he liked to call it, and he seemed to find solace and renewal from his association with it. A chance encounter with Colm Ó Lochlainn, editor of Irish Street Ballads and proprietor of The Three Candles Press, the well known publishing house, directed Séamus' steps towards the field of Irish folk music. Already an accomplished piper, he had completed his secondary education and finished a commercial course but found himself without a job when twenty years old. By chance he bumped into Ó Lochlainn, a friend of the family, who used to make desultory efforts at learning the pipes from his father, and confessed to him that he had decided to cross to England and join the British Army. Ó Lochlainn, shocked for more reasons than one, promptly ordered him to report at the Three Candles the following Monday morning. Ennis spent some time there at the publishing business before taking up employment as a collector of Irish music in the Irish Folklore Commission in June 1942, a post for which he had been recommended by Ó Lochlainn to the Director, Séamus Delargy. Some collecting for the Commission had been carried out by Liam de Noraidh in various southern regions during the previous two years. Ennis was assigned to do similar work in Connemara and Aran, Co Galway. Later he extended his activities to Mayo, Donegal, West Cork and Kerry. In 1946 he was collecting in the Western Isles of Scotland, transcribing a great part of the collection of Scots Gaelic songs made by John Lorne Campbell of Canna. He continued in the employment of the Commission until August 1947, by which time he had recorded almost 2,000 songs and dance-tunes. Ennis then moved from the Commission to Radio Éireann, where his work kept him in the field. He used to recall with amusement how he came up from Galway to Dublin to take up his new appointment and was directed to take up duty the following day in Galway - in fact to continue the work he had left off two days previously. He was of course already a friend of all the great musicians of the day - Padraig O'Keefe and Denis Murphy from Sliabh Luachra, Willie Clancy from Clare and in Donegal the O'Byrnes, the Cassidys and the Dohertys. He was, as they were, a first class performer and when presenting their music to the public did so with an air of authority and with a voice which suited it down to the ground, as the saying goes. Séamus left Radio Éireann to join the BBC, where he was engaged on that extraordinarily popular programme As I Roved Out. He worked there with Brian George and later with Alan Lomax. The Irish LP in the Columbia Folk and Primitive Music series stems from this period. Lomax in his notes writes 'all of us travelled with Séamus ... this collection is his'. The Irish phrase comes to mind Is furasta aithinte ('tis easy to see). A reorganisation in the BBC left Ennis redundant and thereafter he had to depend solely on his music for a livelihood. Before speaking of Séamus Ennis the piper it might be as well here to assess his work in those other fields. He was a noted broadcaster particularly happy when dealing with traditional material. His translations in verse of Irish songs were both accurate and singable. He was unsurpassed as a collector of songs and music. The song collection compiled during his years with the Folklore Commission is a tremendous achievement, unlikely ever to be equalled. The texts, transcribed in the Gaelic script which he delighted to use, are true to the original and the music, set in a beautifully clear hand, is as accurate as staff notation permits in such cases. Ennis was only twenty-three when he embarked on this work. The material had not been exhausted when he left five years later to join Radio Éireann. An immense potential was neglected and left unrealised. As union piper, war piper and dancer, this native of the parish of the Naul, in his round of triumph, exemplified the possibilities of intelligent effort sustained by vitalised national sentiment. 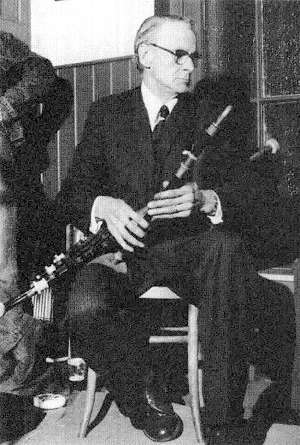 Jimmy Ennis, at the 1912 Oireachtas, had carried off second prize in the uilleann pipes, first in the warpipes as well as the prize for the best all-round war-piper under twenty-five years. He was a pupil of Nicholas Markey, first tutor to the Dublin Pipers Club which had been formed in 1900. Markey was a pupil of the famed Billy Taylor of Drogheda and Philadelphia. Séamus was heir indeed to a very rich tradition of piping. Having a prodigious memory and possessing a complete mastery of his instrument there were few limitations to his acquisition of tunes. He knew hundreds and hundreds and these he rendered in excellent musical taste. Even common-place tunes took a deft turn displaying his total mastery. Exploiting piping ornamentation to the full he never descended into gimmickry. The antics on the chanter indulged in by some younger players did not appeal to him and, more in sorrow than in anger, he would dismiss them with a nod of the head saying "My father would not have done that". His style is best described as non-legato. It was never wholly open but the force and the thrust of the music was never interrupted or impeded by stuttering staccato movements. 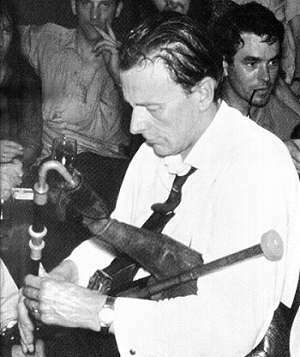 Séamus was present at that memorable meeting of pipers at Bettystown in 1968, from which Na Piobairi Uilleann, the society of Irish, Uilleann, or Union Pipers, was to evolve. In fact it was he who proposed the name for the new society. For one of the activities of the weekend I had prepared a tape of piping, anticipating favourable replies to requests for permission to use the material included. As it would happen Séamus entered the room while a tape of my own piping was being played. I was waiting for his reaction but he merely asked "what year?" to which I replied "1948". "So I thought" was his sole reply as he passed through. Séamus possessed a well-developed streak of showmanship which he displayed in full at this Bettystown meeting. He left it to the younger players to break the ice and an hour or two elapsed before he showed any signs of preparing to play. With great deliberation he took off his coat, rolled up his sleeves, carefully assembled the pipes and then tested the patience of his audience by spending twenty minutes tuning the drones. Eventually the moment arrived: Séamus looked up, enquired whether all recorders were purring and then broke into a spate of music, finishing with a great flourish an hour or more later with The Bucks of Oranmore. By the time we had regained our breath he had unbuckled the pipes and was passing them to Willie Clancy, sitting next to him. Surprised, Willie tried to refuse but Séamus insisted. After a few token tunes Willie took them off to return to Séamus, but was told to pass them on to Liam Og Ó Floinn, and a Coyne set of pipes, already an antique of 130 years and tuned finely to the owner's requirements, was passed round the company as if it were a clay pipe at a country wake. The folklore of piping has many stories of pipers jealously guarding their favourite tunes, of wives being stationed at kitchen doors to ensure no rival sneaked up who, with an ear to a keyhole, sought to acquire some treasured tune by stealth. Séamus' generosity in sharing tunes and technique was a complete break with tradition. Séamus Ennis, with Leo Rowsome, was acclaimed patron of NPU and he certainly responded to this acknowledgement of his contribution to piping. As ever he would dramatise his arrival at our annual meeting, select some exotic mixture - at the last but one it was a 'dog's nose' consisting of a large bottle of stout with a glass of vodka in it - and thus primed would place himself at the disposal of the audience, face this way or that as requested and then wait 'til all machines were in action. All the favourite tunes would be played, requests invited and forms of decoration or ornamentation repeated on demand. He had no trade secrets when among pipers. These performances continued, with regular primings, for three or four or more hours, until daylight brought an end to them. They are now part of the Society's history . Séamus Ennis conducted no school or college of piping and yet he has influenced a multitude of pipers. He was prodigal in performance and has left behind a rich heritage of piping which will ever be a pleasure and an inspiration. As a piper he enriched and enlarged the living tradition and therein lay his most valued contribution to the cultural life of his country. To his friend and fellow piper, Liam Ó Floinn, he bequeathed his pipes. It is not fanciful to see in this final act further confirmation of his care and esteem for that tradition.